There is a very strong scientific consensus that human activities are causing atmospheric greenhouse gas concentrations to rise, that this is causing average global temperatures to increase, and that this is leading to more extreme weather events, causing sea levels to rise, and will negatively affect food production. There is also very strong scientific consensus that this situation requires an immediate and major global response to prevent dangerous anthropogenic interference with the climate system. Humans are warming the planet but dangerous climate change can be avoided - it is unequivocal that the planet has warmed and will continue to warm. Scientists are more confident than ever that humans have been the dominant cause since the mid-20th century. However, it is still possible to avoid 2 degrees Celsius of warming. In particular, this will require global emissions to peak before 2020 and global fossil fuel use to be cut by around two-thirds by 2050. It is also still possible to avoid 1.5 degrees warming. Warming is leading to more extreme weather - warming has already increased the occurrence of some types of extreme weather events and further temperature increases will see the frequency of heavy rainfall events and very hot days increase, with the severity increasing in proportion to warming. Each degree of warming will increase rainfall intensity by 5-10 per cent. There will be more droughts and floods. Sea levels are rising – they will continue to do so over the coming decades and centuries as sea water expands as it gets warmer, as well as additions from glacier melt water and losses from the Greenland and Antarctic ice sheets. For each degree of warming a sea level rise of 1 to 3 metres is expected if the warming persists for several millennia. Sea level rises are unlikely to exceed one metre in the 21st century. The poorest in the world are and will suffer the most - people who are socially, economically, culturally, politically, institutionally or otherwise marginalised are often highly vulnerable to climate change. Women, children and the elderly are particularly at risk. Africa is particularly vulnerable, even with high levels of adaptation. Food production will be hit - climate change is expected to reduce crop productivity by as much as 2 per cent per decade. This is within the context of growing demand from an increasing population. The risks to food production are not spread evenly, with tropical countries at greatest risk. Impacts on production could be much worse in combination with other stresses such as ozone pollution and water stress. Severe threats to wildlife - 20 to 30 per cent of the plant and animal species assessed are at increasing risk of extinction as global mean temperatures exceed a warming of 2 to 3 degrees above pre-industrial levels. Climate change will contribute to increased extinction risk for terrestrial and freshwater species over the coming century. Investments in energy efficiency and low-carbon energy need to grow substantially - investment in low emissions generation technologies needs to double to around $300 billion per year, investments in energy efficiency need to grow by over $300 billion per year, and $21 to $35 billion per year needs to be invested in deforestation. Investment in fossil fuels should fall. Hundreds of billions of dollars would need to be transferred to developing countries to help them develop their economies in a low carbon way. Although these numbers are large they are very small compared to $355 trillion invested in the stock market. They also take no account of co-benefits, reduced costs from lower climate change impacts, nor efficiency savings. There are significant co-benefits from taking action on climate change – such as reduced health impacts from air pollution, healthier lower meat diets, afforestation which can benefit biodiversity, and reduced risks from water scarcity. Governments’ delays in taking sufficient actions leads to higher costs – the pledges currently made by governments to cut emissions would not avoid warming of more than 2 degrees. Delaying sufficient action to cut emissions is making the task of avoiding 1.5 or 2 degrees warming much more difficult, for example requiring the development of technologies to take substantial amounts of carbon out of the atmosphere. Delay will substantially increases the costs of avoiding dangerous climate change. The impacts from 4 degrees of warming are extremely severe – business as usual in greenhouse gas emissions would lead to around 4 degrees of warming by 2100. This would lead to large increases in water stress and drought in a number of regions (for example, southern Europe and southwest North America). It could lead to very large releases of methane from melting permafrost, triggering still greater levels of warming, and the near complete loss of the Greenland ice sheet which over a millennium or more would cause sea-level rises of up to 7 metres. It would lead to unacceptably high risks of catastrophic irreversible tipping points. Friends of the Earth’s view is that the magnitude of the risks to humans and the environment from temperature rises, extreme weather sea level rise and irreversible effects means that we should keep temperature rises below 1.5 degrees. Governments should agree on a global carbon budget to keep to this scenario, and immediately implement strategies to stay within this budget. This would require rapid and radical action to reduce the use of fossil fuels. Carrying out energy efficiency improvements and deploying low-carbon technology will have significant benefits. There is also strong political, business and civil society consensus on the need for action on climate change. 196 states have signed the 1994 United Nations Framework Convention on Climate Change, whose “ultimate objective is … stabilization of greenhouse gas concentrations in the atmosphere at a level that would prevent dangerous anthropogenic interference with the climate system”. Some of the many other endorsements of the need for urgent action come from the Ministry of Defence, the World Economic Forum, the International Energy Agency, the British Medical Association, Shell and BP. Climate science is deeply complex and there are many remaining uncertainties. However, as the joint Science Academies put it, “a lack of full scientific certainty is not a reason for delaying an immediate response”. There are a number of people and organisations who are sceptical about the scientific case for action on climate change. In our view, these people have not made a compelling case. Two famous responses are Nigel Lawson’s 2008 book “An appeal to reason”, which was critiqued by Sir John Houghton, and Bjorn Lomborg’s 2007 book “Cool it”, critiqued by Frank Ackerman. Although everyone is entitled to their view, the climate denial case is in the overwhelming minority, and the political and scientific focus is now rightly on how to prevent dangerous climate change. Friends of the Earth England, Wales and Northern Ireland believes that the world needs to reduce the risk of a 2 degrees rise to “unlikely” levels at the very least. Research in our Reckless Gamblers report suggests this means the world should emit an absolute maximum of 1100 GtCO2e from 2010-2049, coupled with major action to reverse deforestation. This carries with it far more risk than we think is desirable, but even a 1100 GtCO2e limit will require a very steep and unprecedented decline in global emissions. A likely chance of avoiding 2 degrees is roughly equivalent to a 50:50 chance of avoiding 1.5 degrees - Friends of the Earth International have adopted a 1.5 target as its main climate goal. Some have suggested that in order to keep temperature rises low, methods to reflect the sun’s energy back into space should be used (so called ‘solar-radiation management’ technology). The Royal Society have outlined the significant risks with such an approach and Friends of the Earth is in favour of a safer path, based on cutting emissions. Some methods of extracting carbon from the air (eg some permaculture techniques) may also have a role to play - we set out the pros and cons of various such "negative emissions" technologies in our Negatonnes report. The climate is changing here in Wales, and its effects are already being felt. Already average temperatures are more than 1°C higher here than100 years ago, and average annual rainfall has been increasing since about 1970. Rising sea levels, combined with greater frequency and higher intensity of storms, are increasing the risk of flooding. 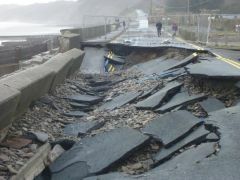 There was evidence of this in January 2013 with significant flooding and storm damage in some Pembrokeshire coastal villages, such as Amroth and Newgale, and on the seafront at Aberystwyth. We can tackle climate change, but we need decisive action from governments and industry. And we need it now. We need to produce huge amounts of zero-carbon energy, live in well-insulated homes, use sustainable forms of transport, and minimise the waste we produce through more efficient use of resources. These solutions would also mean better, healthier lives and a fairer society. And leading the green economy revolution would provide tens of thousands of jobs throughout Wales.